Have you noticed that Jesus really is alive and active in our world, today? He is, and I challenge you to take notice! If we don't bear witness to Him, who will? I was at Trader Joe's the other day and was in line to pay. The cashier asked the person in line ahead of me, "How was your day?" and the person responded, "Terrible. I was in the hospital all day, and just found out I have cancer." The cashier stopped and said, "I am sorry." But that wasn't enough for that 20 something year old cashier. He tapped a co-worker to bag up the groceries and ran over to the flowers, digging through them to find the right ones, came back, handed them to the person and said, "Here, I want you to know that you matter." He was Jesus to the person. The risen Jesus!!!!!!! Not me, I didn't even think to go and get her flowers, but Jesus did, through the heart and soul of a young cashier. Jesus IS alive. He IS risen. Please share your stories with others. Bear witness to our Savior who is very busy in this world we are journeying in these days. What is new and thought provoking at the Resource Center?? We now have a copy of Volumes 1 and 2 of the new Annotated Luther, published by Fortress Press. This is a brand new 6 volume series, and only the first 2 volumes are in print at this point, and we have them! Volume 1: "The Roots of Freedom" contains many of the writings that defined the roots of reform set in motion by Martin Luther, from the Ninety-Five Theses through The Freedom of a Christian. Included are a variety of compositions produced between 1517 and 1520 that reveal Luther's pastoral and theological commitments, his earliest confrontations with Rome, and his defense of views that led to his excommunication. Volume 2: "Word and Faith" contains a number of the writings categorized under the theme Word and Faith. Luther was particularly focused on what the word "does" in order to create and sustain faith. In the treatises in this volume we hear Luther's understanding of Scripture and theology as he continues his growth as teaching theologian, pastor, Biblical exegete and apologist for the faith. Don't miss out on reading these amazing collections of writings! To read them, contact Janet and request The Annotated Luther. Still looking for some ideas for your VBS this summer? 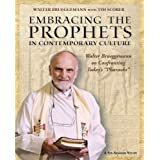 Do the Prophets speak to contemporary culture? Walter Brueggemann, arguably America's leading Old Testament scholar and theologian, takes us on a wild ride through the poetic prophecy of the Hebrew Scripture, identifying cultural contexts, putting a framework to Israel's history, and most significantly (and at times most challenging) drawing connections between Israel's sociological, economic, and spiritual status and that of America today. Ready to give this study a try? Contact Janet. These books are returning with great accolades! If you are interested in learning more about the life and development of Martin Luther, you will LOVE this series! Click here to Email Janet your request. Get your name on our waiting list. Reading this series is a great way to get excited about Reformation 500!!!! It's coming, ready or not! Here's your chance to really dig in to Luther's theology and the time in history that he lived. Do you sense change in our world? Let's all pray for that! Here is a downloadable guide to "Common Prayer: From conflict to communion" encouraging Lutherans and Catholics to join hearts and voices in intercession. To date we have sent out over 1,500 Small Catechism pamphlets. Luther's Catechism is relevant today! Take the First Commandment: You shall have no other Gods. We should fear, love and trust God above all things. Our Lutheran heritage has SO much to offer each one of us, each day. "For what is certain in this life? Today we stand; tomorrow we fall. "God wants us to work together with him and does us the honor of desiring to accomplish his work with and through us... Although God alone is blessed he still wants to give us the honor and not be blessed by himself but that we share that blessedness with him." Fridays - 8:30am-11:00am, We will be CLOSED Friday, April 29.